Below is our review of the Amazon Kindle Fire, a 7" tablet, featuring a 1.2GHz processor and 8GB memory, with almost 9 hours battery life. The Amazon Kindle Fire tablet features a clear 7" screen, weighs just 400g, and so is small and light enough to be ideal for those who are out and about - those who are travelling, commuters and students in particular. It is equally suited for home use - fast to start up, takes up less room than a laptop - ideal for sofa web browsing. Small enough to easily fit into a backpack or handbag, it is highly portable and provides you with easy access to your favourite books, music, films and games, as well as web and e-mail access. A tablet of this size is the happy medium between an iPad and a smart phone - it's large enough to comfortably browse the web on, but small enough to travel with. You also get access to Amazon's cloud storage with the Kindle Fire - this allows you to gain access to all of your Amazon content, such as any apps, games, music and books you have purchased - which you can access at anytime. There is also a lead supplied allowing you to store any music / files you have on your laptop or PC - 8GB memory is available for this purpose. 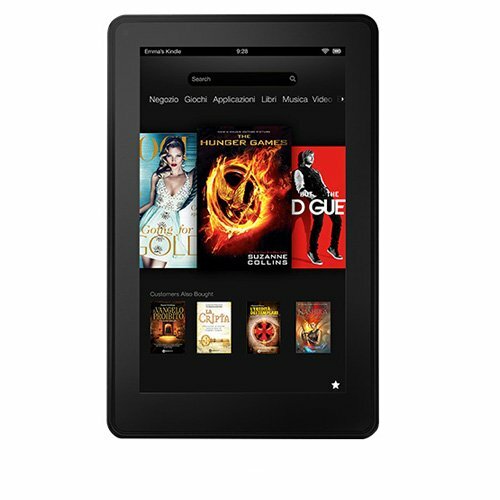 For future media purchases, the Kindle Fire also easily links into your Amazon account - enabling you to purchase content whilst on the move. The tablet is easy to setup with Wi-Fi - we were up and running very quickly, and web browsing was fast and easy to navigate. The touch screen felt accurate and easy to control - no complaints here whatsoever. The battery life of up to a claimed 9 hours is pretty impressive too - making this device suitable for both home usage as well as outside. The screen of the Kindle Fire isn't as sharp as the more expensive Kindle Fire HD - however it still offers a great picture at 1024 pixels by 600 pixels resolution (compared to 1280 pixels by 800 pixels resolution of the Kindle Fire HD). Colours are displayed vividly, and the brightness is adjustable, so you can tailor it to your preferences and environment, as well as potentially use less power. This 7" display is surrounded by a thick bezel, making this tablet easy to grip even for smaller hands. Two stereo speakers provide the audio for this device, and offer pretty good sound quality, especially considering the small size of the tablet. Overall the construction is pretty good - the tablet feels solid, and despite it's light weight, there is virtually no flex in the Kindle Fire. Cons: The Kindle Fire HD is also out now, which offers a few more features for not much more investment. To conclude - the Kindle Fire is a very capable tablet, offering you access to the internet, e-mail, apps and your media collection whilst out and about. If you can stretch to a little more then possibly consider the Kindle Fire HD - if not then the Kindle Fire is still a decent investment.